Asus has announced a new video card using Nvidia technology that it says is 14% faster overall than the impressive Nvidia GTX Titan. 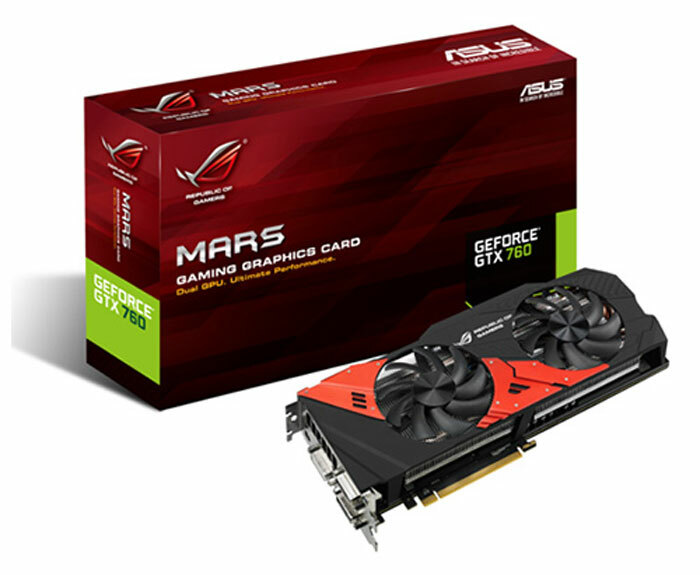 The new video card is called the Republic of Gamers Mars 760. The video card features dual Nvidia GeForce GTX 760 GPUs in the special cooling solution. The cooling solution keep the card 20% cooler than comparable cards while being significantly quieter. The Mars 760 video card is a dual-slot unit that features special Asus technology in the voltage-regulator module for stable power delivery. The video card also supports Asus GPU Tweak software making it easy to overclock the GPUs. The video card has 4 GB of GDDR5 RAM. Asus says that it special cooling solution offers six times the airflow as the Nvidia reference design. The card uses a 12-phase power design that reduces power noise by 30% and enhances efficiency by 15%. The reduced power noise and enhance efficiency means that gamers are able to overclock their video cards the higher frequencies before they become unstable. The video card also uses custom sourced black metallic capacitors offering 20% improved temperature endurance for better lifespan than standard units. The video card will launch in the first half of December at an undisclosed price.